We've cracked one form of Goldeneye's compression. It's taken us months and an extraordinary amount of frustration, but at long last…we've done it! 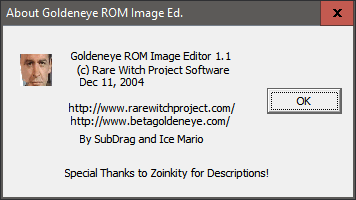 Update 1.1 of our ROM Editor. This time…you can replace 1,743 images, nearly every image from the game with any properly sized user image you create. Remake full level textures, face sets, character sets, there are so many possibilities. Save all of your changes as permanent ROMs or an ips patch, so that your textures will now be permanently stored in a ROM! Also included are the discovery of beta textures and the All Bonds hidden away in memory! Got great pictures or great ips patches? Send 'em over! We welcome your comments. Zoinkity - All those great descriptions. Rune - Many of the superb textures. We are not responsible if you decide to go out and kill someone because of this (please, please don't). We simply are proiding a tool to insert a texture into a game for amusement purposes. On usage, you waive the creators of this tool of any responsibility.